Most modern TVs are slim and their speakers deliver poor sound. Luckily, soundbars come in handy as a great solution for adding rich sound to modern TV sets. They’re specially made to enhance the quality and loudness of sound from your TV. However, it’s not always easy to get such external speakers working. Once in a while, they may fail to work as needed due to various reasons. To make matters worse, you may have set up everything correctly but you still fail to get the system working. 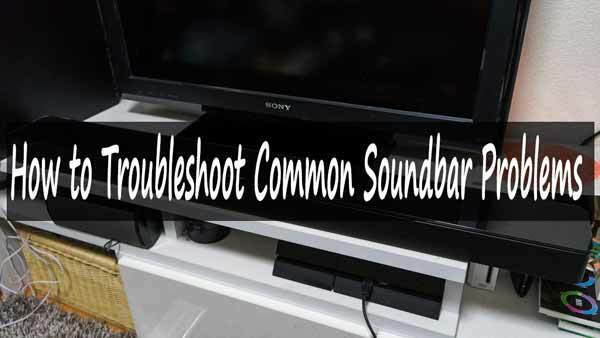 If you’re facing troubles with your soundbar, here’s how to troubleshoot common soundbar problems. There’re many people who face power issues with their speakers. In case you’re trying to power on your audio bar but it fails, then there’s something wrong with the power connection. Maybe it’s not receiving power or its internal power system has failed. The first thing you should do is checking whether you’ve actually turned on the power socket. Next, turn the speaker on using its on board power button or using the remote. If it fails to power on, try it out on another power socket. If this also fails, check whether the cable has any signs of damage and whether it’s plugged firmly into the socket and the soundbar. If it’s connected through another device like a power extension, connect it directly to mains wall socket. In case it fails to power on, try another power cable. If all these attempts fail, contact the manufacturer or your retail store. Maybe you’re watching your favorite movie or some music videos and suddenly, the speaker goes to sleep mode on its own or turns off automatically. In case you experience such an incident, the most likely cause is having an activated sleep timer. Check the settings and turn off the “sleep timer”. This way, you’ll not get an interrupted listening experience. Also, ensure the speaker is not set to automatically power off upon turning off your TV. In case you’ve connected your television set to the soundbar using a cable but there’s no audio, the most likely cause of the problem is an improper cable connection or a malfunctioning cable. If the speaker is actually turned on and there’s no audio, first check the connection. Start with disabling the inbuilt TV speakers using the TV remote. Ensure the speaker option on the TV is set to external and check whether you’re now getting sound. Also, most audio bars can be easily connected to a TV and other components via HDMI, optical and RCA cables. For instance, if you’ve connected your television set to the speaker using any of these cables, ensure the cable is firmly plugged in. You can unplug and plug in the cable firmly. Still no sound? Try a new cable and check whether it’ll work. In case you’re still unable to get sound, then you should try another connection method. For instance, if the HDMI connection is not working, try using an optical or RCA cable based on what your television and audio bar supports. If the devices have multiple ports for each type of connection, try all the ports until you get a working one. While doing this, ensure the source input of the audio bar is set appropriately. For instance, set the source to optical when using an optical connection or AUX when using an AUX to RCA cable. If you’ve attached a component to your television, change the source of the television to component. In case you’ve connected the component device to the speaker, ensure the input source on your speaker is set to component. Also, ensure the volume on both devices is turned up while troubleshooting cable connections. In case you’ve tried all possible cable connections and unable to get sound, you’ll need to reset the soundbar. Press the reset button on your soundbar for some seconds to reset it. Then check whether you can now get sound. If all these options fail, contact your manufacturer for further assistance. If your warranty is expired, you can have the unit checked by a local electronics repair expert. Some soundbars have a separate subwoofer. In case there’s no sound from the subwoofer, first check whether it’s actually powered on. In case it’s not receiving power, ensure the power cord is connected firmly to the sub and the power outlet. Also, ensure you’ve connected the cable to a working power outlet. If it’s still not powering on, check the cable for signs of damage or try a new power cable. In case the subwoofer is powering on but there is no sound, maybe you have not linked it to the audio bar. You can reboot the two units and try linking them again. If they still fail to link, try to reset them one by one by pressing the onboard “reset” button. Still no power or sound? Contact your retail store or manufacturer for further advice. Today, most speakers come with wireless connectivity options. For instance, the best options come with Bluetooth connectivity. This enables you to connect devices wirelessly. Wireless connections eliminate the use of cables and enhance portability. At times, you may have problems with pairing a device to the speaker via Bluetooth. In case your device is not pairing, first ensure no other devices are paired and try again. This may happen since some Bluetooth speakers only pair one device at a time. Also, try pairing the devices when they’re close to each other since some devices are limited in terms of Bluetooth range. Another troubleshooting option is to reboot both devices and try to pair them again. While doing this, ensure Bluetooth connectivity is active on the soundbar. You can turn on Bluetooth on the audio bar using its remote. If you’re still unable to pair them and you’re connecting them according to the manufacturer’s instructions, you’ll need to reset the speaker. In case you reset it and Bluetooth connectivity problems persist, contact the manufacturer. Regardless of the brand of your sound bar, these troubleshooting tips will surely work for you. Always try each solution at a time. If you’re unable to find a solution, first contact your retail store or manufacturer for further assistance before taking your speaker to a local repair shop. In case your speaker has malfunctioned and it’s still covered by a warranty, you might get a free replacement or free servicing from the retail store or manufacturer. Only take it to a local repair shop when nothing seems to work and its warranty cover is expired.